The Church organ was installed in 1899 at a cost of £155, and it was enlarged in 1907 at a further cost of £100. Plans were made, and funds raised, to move it in 1936 - but it never was. 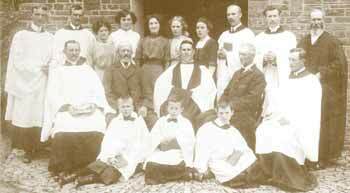 As far as can be traced there appears to have been thirty six instituted vicars of Bradworthy. Back row: Fred Gilbert, R.G. Collacott, Mrs. Kerslake, Mrs. Cholwill, Mrs. F. Slee, Mrs. M. Johns, Mrs. Horn, Roger Walter, John Walter, William Jennings. Middle row: T. Gilbert, Mr. Burrow, Rev. A.E. Dobson, John Bryant, John Kerslake. Front row: Arthur Bryan, Stanley Oke, Willie Oke. At the turn of the century the Vicar was the Rev. W.T. Wellacott MA, who came in 1893. He was a true country parson, farming his glebe, organising agricultural and horticultural classes, breeding pedigree dogs and taking an active part in village life. 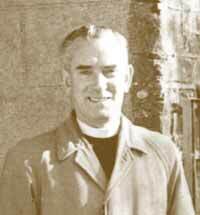 Above all he was a devoted parish priest. In 1911 he was followed by the Rev. A.E. Dobson, whose incumbency stretched over 46 years. He was an Army padre in the 1914-18 War, a keen musician and mainly responsible for establishing a brass band in Bradworthy. The Rev. Thomas Gibby BA, BD (1958-63) organised a good choir. The Rev. Arthur Procter (1963-65) was a VC, won for bravery on the battlefield in Arras in 1916. He was an RAF chaplain in the Second World War. Congratulation to Mr. and Mrs. Richard Westaway Oke, of the Square, Bradworthy, who have celebrated their golden wedding. 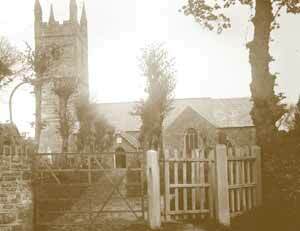 They were married in Bradworthy Parish Church by the Rev. W.T. Wellacott (Vicar), assisted by the Rev. C. Finzel (curate) on 14th April 1894, and lived in the same house ever since. The Rev. Lingham Lees retired in 1971. Mr. F. Thorne, Rev. Richards, Mrs. Lingham Lees, Rev. Lingham Lees, Mrs. L. Elliot, Rev. Bulcock, Miss Nancy Kerslake, Mrs. J. Gerry. The Rev. Harold Lingham Lees MA. BSc. 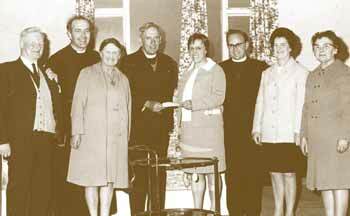 (1965-71) displayed much energy in raising money for the Restoration Fund. He inaugurated the first Gift Day. He was an RAF padre in the Second World War. The Vicar of Bradworthy, the Rev. H.T. Lingham Lees, on Saturday duly carried out his plan to sit in the Parish Church porch from 5am until midnight to collect donations for the tower restoration fund. The gift day was a great success, well over £500 being collected. The vicar's 19-hour vigil was evidently justified as his first caller arrived at 5.30 and he received his last gift minutes before midnight. "It was great fun. I enjoyed every minute of it." said the Vicar. "They're terribly keen on the tower around here, and everybody was very anxious to relieve me of the trouble of adding up the money." The Rev. 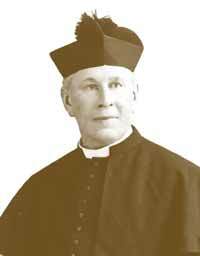 Charles Arthur Sutton (1974-76) was ordained in Canada where he worked for many years. He was a chaplain in the Royal Canadian Air Force during the 1939-45 War. 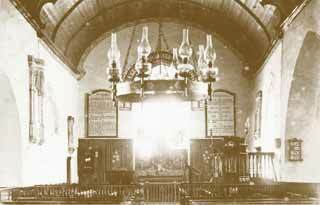 The inside of the St. John's Church in the 1920's. Returning to England his various activities included Missions to Seamen chaplain in Belfast and Cardiff, and work with the Church Railways Mission in South Africa. 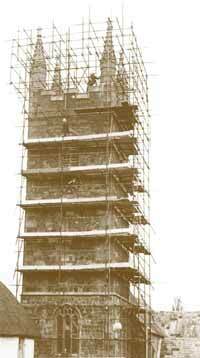 In the 1960's repair work was carried out on the Church tower. The Rev. Peter Sutton, the last instituted vicar, served in the army (R.A.S.C.) from 1939 to 1956 and was involved in the French and German campaigns of 1944-45. He is a man of many interests, which he lists as local history, wood carving, brass bands and wine making. He transcribed a vast amount of historical records, now available in Bradworthy for reference and research. He retired in 1990. 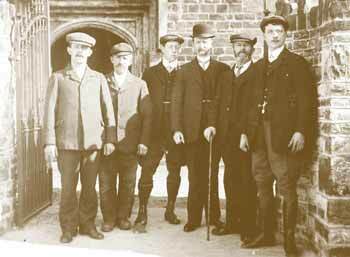 The church wardens in 1913. Richard Oke, John Bond, Austin Wellacott, Tom Gilbert, A.J. Burrow, Charles Binmore. The Rev. Norman P.G. Last was Priest-in-charge until his retirement in 1997. He served in the Royal Air Force as a pilot and instructor on fighter planes for a total of twelve years. Later he was a civil airline pilot for eighteen years. He retired to Sidmouth. The Rev. Richard Dorrington was appointed Priest-in-charge in October 1998, and has since been upgraded to Rector.